Jack St. Clair Kilby was born November 8, 1923 in Jefferson City, Missouri. His father was Hubert Kilby, an engineer for power companies. When Jack was in school his favorite subject was American History. When he was 14 years old he watched his dad use an amateur radio which he had borrowed from a neighbor to contact his business associates during a blizzard when the phone lines were down. Jack became so interested in the radio he built his own set and became a ham operator. In order to operate a ham radio, the Federal Communication Commission (FCC) started requiring a license. Jack studied and passed the test. After graduating from high school he wanted to become an electrical engineer. He applied at MIT, the famous Massachusetts Institute of Technology, but he didn't pass the entrance examination. He needed a score of 500 to pass the exam, and he made 497. Once during an interview he said he even remembered the algebra problems he thought he got wrong. He enrolled at the University of Illinois where his parents had attended college. Later he earned a master's degree in electrical engineering from the University of Wisconsin. He served in the army during World War 2 in India and Burma working with radio transmitters. While serving in the Army he saw the field radios were heavy and bulky, so he went to Calcutta and bought a truckload of black-market* radio parts and made a smaller, lighter radio that was easier to carry and more dependable than the radios they had been using. After graduating from college he took a job with Centralab, a small company in Milwaukee, Wisconsin. He married a young woman named Barbara Annegers and they had two girls and then became grandparents to five granddaughters. In 1958 he left Centralab to move to Dallas, Texas to work for Texas Instruments (TI). It was hard for him to leave his job in Wisconsin because his family was settled there, but he thought he could develop his ideas better at a larger company such as TI who agreed to let him work nearly full time on making electronic components smaller. That summer after he began working for them, most of the TI employees left for a two-week vacation, but Jack had not been there long enough to accumulate vacation time. During that two-week period alone in the lab he thought about a problem that needed a solution. Electronic devices at that time required hand-soldered* circuit boards which made the products very large and expensive. Jack thought there must surely be a better way. He began working on a prototype* creating a very small circuit board about the size of a fingernail on which he put a transistor,* three resistors,* and a capacitor* connected with gold wires. This first integrated circuit (IC) was crude looking. He later said if he had known he would have to look at it for 40 years he would have "prettied it up a little bit". At the same time at the Fairchild Semiconductor Corporation in California Robert Noyce came up with a similar idea. Both Kilby and Noyce are accepted as co-inventors of the Integrated Circuit* and TI and Intel share patents related to it. The related products they produce today are worth more than $1 trillion annually. You can look up the patent for Kilby's Miniaturized* Electronic Circuits by searching for patent #3,138,743. Great ideas are sometimes developed simultaneously. The idea for the telephone is attributed to Alexander Graham Bell and also to Elisha Gray and Antonio Meucci. The multiple discovery of calculus is attributed to Isaac Newton and also to Gottfried Leibniz. Another example is the development of the polio vaccine by Hillary Koprowski, Jonas Salk, and Albert Sabin. The new product invented by Kilby and Noyce was called the microchip. The word "micro" means very small. The microchip is a very small chip less than a quarter of an inch square and only the thickness of a few pages of a book. Even though it is so very small it has thousands of electrical components. This invention revolutionized the development of the computer. The first computer built in the 1940s weighed over 30 tons (more than 60,000 pounds), was the size of a gymnasium, and cost a million dollars. Then in 1947 the transistor was invented and replaced the bulky glass electronic tubes in the computer, but a computer for the general population was still not possible until the invention of the integrated circuit. For several years after the invention of the integrated chip little was done to develop it into something useful, but as refinements were made it began to be mass produced. Instead of using germanium,* a costly material, to produce them, they changed to silicon,* which is made of sand. It reduced the cost by a factor of a million to one. The components were literally "dirt cheap". The uses of the chip have been world-changing. In 1962 it became the brains of the Minuteman Intercontinental Ballistic Missile (ICBM) guidance systems. It was used in the Apollo spacecraft. Because of its development we have hand-held calculators, hearing aids, the personal computer, digital wrist watches, printing machines, and space travel. It is also used in microwave ovens, communication satellites, video games, cars, store scanners, cell phones, clocks, and TVs. Microchips can be implanted in a person's skin which can return partial sight or hearing. Artificial limbs can be controlled by people who have lost arms or legs. Information chips can be implanted in pets to speed their return if they get lost. While he was working at TI Kilby also invented the hand-held calculator which was small enough to fit in a coat pocket. In 1970 Kilby left the company and became a self-employed inventor and consultant. He received more than 60 patents on his inventions. After he left TI he began to do research in solar power generation. From 1978-1984 he served as a professor of electrical engineering at Texas A&M University in College Station. Also in 1970 he received the National Medal of Science. Ten years later in 1980 he was inducted into the National Inventors Hall of Fame sharing honors with such notables as Thomas Edison, Henry Ford, and the Wright brothers. In the year 2000 he received the Nobel Prize in Physics. On that occasion he said if Robert Noyce were still alive he would be standing there with him. Noyce had died in 1990 after a sudden heart attack. Always an humble person, Jack Kilby was a man of few words. When asked to make a speech he said, "Thank you." When asked to say more he said, "Thank you very much." His daughter said he had a short speech and a long one. The short speech was "Thank you", and the long one was "Thank you very much." While seeking to minimize his role in his contribution to the digital world he enjoyed telling the story of the rabbit and the beaver looking at a dam. When the rabbit asked the beaver if he had built it, the beaver replied, " No, but it was based on an idea of mine." When his Kansas home town wanted to rename the high school after him calling it the Jack S. Kilby High School, he protested saying it would be a lot of trouble and he wasn't worth the fuss. When he received awards he enjoyed taking his friends and his whole family with him to the event where the award was being presented. They even traveled with him to Sweden when he received the Nobel prize in Physics in 2000. 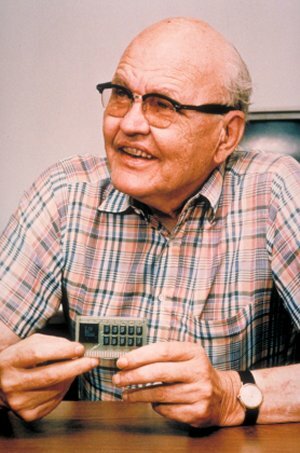 Jack Kilby died of cancer June 20, 2005 at the age of 81. Few men have contributed so much to technological advancement for the betterment of mankind. This biography by Patsy Stevens, a retired teacher, was written December 3, 2011. Press "Go" to search for Integrated Circuit. This page displayed 18,684 times.